We have 4 Guppies linked to Comsol. Comsol use Actility network servers. Actility report the position of the gateway that heard the device. 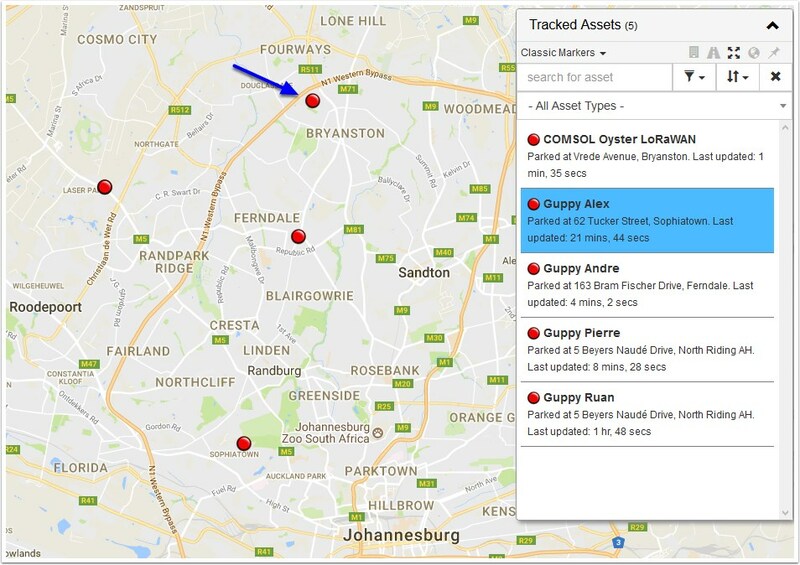 Guppies don't have GPS - they're just LoRaWAN tags with accelerometers. So we're plotting these gateway positions on the map in TG, as reported by Actility. The interesting thing is that all of the Guppies are at our office, shown by the Oyster (which has GPS) and the blue arrow. So the Guppy positions are all over the show - up to 14km away! So that's not particularly useful on this network. If you were to put up your own gateways, at your depots for example, this could be very useful. When a network like Comsol gets more dense (densifies? ), and the LoRaWAN localisation improves, it could be a lot more useful.